Emigrants on deck, S.S. Patricia. Credit: Levick, Edwin, 1869-1929. Details below. The Institute for Historical Studies is proud to announce its residential Research Fellows in 2017-2018. 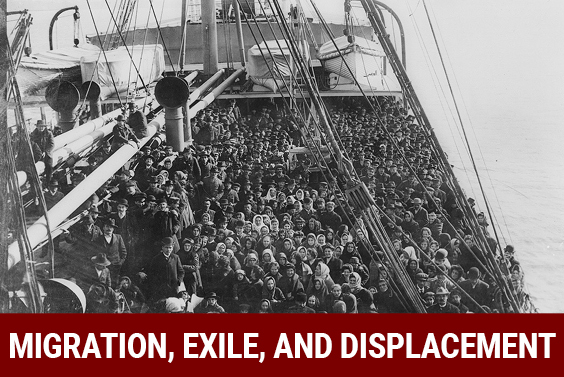 Dr. Titas Chakraborty (Oberlin College), Dr. Alberto García, (University of California, Berkeley), and Dr. Yael Schacher (University of Connecticut) will contribute to next year's theme of Migration, Exile and Displacement, which seeks to examine the origins, meanings, and impacts of population movements in history. UT Professor of History Madeline Y. Hsu, serving as IHS Program Coordinator next year, will oversee the institute's major annual conference on migration in the spring, while Miriam Bodian, Professor of History at UT, assumes the role of institute Director beginning this September. Dr. Titas Chakraborty, who earned her Ph.D. at the University of Pittsburgh in 2016, is a Visiting Assistant Professor at Oberlin College. As an IHS fellow, she will revise and expand her book project, "Mobile Workers of the Companies: Labor, Migration and Resistance in Bengal, 1650-1837." Chakraborty's scholarship captures the working lives of Bengali workers in the East India Company from the pre-colonial to colonial area, in particular their use of labor mobility as a form of agency and resistance. Image left: Factory of the Dutch East India Company, Hougly, Bengal. Hendrik van Schuylenburgh, 1665. Wikicommons. A Visiting Lecturer at the University of California Berkeley, Dr. Alberto García Maldonado (Ph.D., 2016, UC Berkeley) is working on a project entitled "The Politics of Bracero Migration." Dr. Garcia examines the "Bracero" work program, which brought seasonal Mexican laborers to the U.S. between 1942 and 1964, and the varied political and religious reactions to the program in Mexico. States that had been centers of conservative Catholic anti-government opposition to land appropriations in the 1920s and 1930s continued that resistance to government policy, distinctly shaping the Braceros' recruitment and selection process. Above: Mexican workers await legal employment in the United States, Mexicali, Mexico. 8 February 1954. Wikimedia Commons. Los Angeles Times photographic archive, UCLA Library. Dr. Yael Schacher is an Adjunct Faculty member at the University of Connecticut. Her project, "Exceptions to Exclusion: A Prehistory of Asylum in the United States, 1880-1980," recounts the origins of America's asylum standards and the role that religious prejudice assumed in forming them. Schacher earned her Ph.D. in 2016 at Harvard University. Image left: Families waiting in line at Hebrew Immigrant Aid Society in New York. Milstein Family Jewish Communal Archive Project, YIVO Institute for Jewish Research.